Remover of obstacles (to union).om vaikunThAya namahSrI BhaTTar derives the meaning from the root kuThi gati praghAte -obstructing the path. Thus kunThA signifies the obstacles to union.vaikunTha-s are those whose obstacles have been removed. The obstacles tobhagavAn are sins. He is the remover of sins, and so He is calledvaikunTha.SrI rAdhAkRshNa SAstri explains the nAma as vigatA kunThA tasyAh kartA -One who regulates those that tend to go their own way if left unobstructed.At the beginning of the earth, when the pa~nca bhUta-s tended to expanduncontrolled without uniting with each other, bhagavAn controlled this andmade them co-exist through union with other.SrI Sankara and SrI BhaTTar both quote the following Sloka from mahAbhAratain support of the concept that bhagavAn brings about the union of seeminglyincompatible things: "mayA samSleshitA bhUmih adbhir-vyoma ca vAyunA | vAyuSca tejasA sArdham viakunThatvam tato mama || (SAnti343-50) "By me the earth was united with water, ether with air, and air withfire. So I am called viakunTha".He is vaikunThah also because He removes all obstacles to attaining Him forHis devotees, and unites them with Him (SrI P.B. aNNa~ngarAcArya).SrI satyadevo vASishTha explains that One for whom all obstacles orobstructions (kunThA) have been removed is vikunTha. Or One who removes allobstacles is vikunTha also.SrI rAdhAkRshNa SAstri gives yet another explanation. bhagavAn is calledvaikunThah because He was born to Subhra and vikunThA in the fifthmanvantara. He then married ramA and acceded to her request to create aplace for her enjoyment, and this place was called vaikunTha. He Himself isthis vaikunTha. This is supported by vishNu purANa 3.2.41 and bhAgavata8.5.4-5.The dharma cakram writer takes the interpretation to a level where itapplies to lives of individuals for whom He removed the obstacles facingthem from attaining Him and united them with Him. The cases of prahlAda,paraSurAma, karNa, hariScandra, vAli, etc. are given as examples. The Purifier.om purushAya namah.This nAma occurred earlier also (nAma 14), even though it was not identifiedas a recurring nAma at that time. A summary of the vyAkhyAna given for nAma14 is included here. a. puru sanoti iti purushah - One who gives in plenty. b. purA AsIt iti purushah - One who existed before anything else. c. pUrayati itit putushah - One who completes and fulfils existenceeverywhere. d. puri Sete iti purushah - One who is reclining in this body.In support of d) above, SrI Sankara gives the additional support from theSruti-s: sa vA ayam purushah sarvAsu pUrshu puriSayah (BR. Upa. 2.5.18) -He is indeed called purusha who lives in all the bodies. SrI v.v.rAmAnujangives the following support from divya prabhandham in support of a):vENDiRRellAm tarum en vaLLal (tiruvAimozhi 3.9.5); enakkE tannait-tandakaRpagam (tiruvAImozhi 2.7.11).To the above four explanations, we now add the following: e. "usha dAhe purUn sarvAn oshati dahati iti vA purushah" - He whooutshines everyone. f. "pApmana oshah tasmAt purushah" - He who burns away all sins. g. piparti pRNAti pAlayati pUrayati iti vA purushah - He who protects -from pR pAlana pUraNayoh - to protect or nourish h. purah + kushan = purushah (from pura agragamane) - pura agragamanepurati agragAmI bhavati iti vA purushah - He who is the Leader or who is inthe forefront. i. pUrvah asmAt viSvAt tat AdikAraNatvAt iti purushah - He who is theoriginal cause of the world. j. purUNi bhuvanAni samhAra samaye syati antam nayatIti purushah - He whotakes the worlds to their end at the time of samhAra or pralaya.Under the current nAma, SrI BhaTTar gives the two new interpretations above- One who burns (purifies) - oshah - all sins by nature: sa yat pUrvahasmAt sarvasmAt pApmana oshah tasmAt purushah. This is close to the Srutipassage that SrI Sankara gives as a support - sa yatpUrvo'smAt sarvasmAtsarvAn pApmana aushat tasmAt purushah (Br. Upa. 1.4.1).The nAma can also be derived from the root pR to protect or nourish (g).Also, from the uNAdi sUtra purah kushan and from pura agragamane (pANi nisUtra), the meaning "One who leads or is in the forefront" (h) is derived.SrI P.B. aNNa~ngarAcArya svAmi chooses this meaning in his abridgedcommentary. SrI v.v.rAmAnujan nicely summarizes the guNa-s indicated by thenAma purusha as "rakshaka", phala prada" etc.SrI satyadevo vAsishTha, who gives most of the interpretations that havebeen covered by other vyAkhyAna kartA-s, also adds the last one above. The vital air (Life-breath).om prANAya namah.This nAma occured earlier (nAma 67, 322). There the explanation given wasprANIti iti prANAh - That which gives or sustains life. In addition togiving prANa to everything in this world, He is also the prANa for all thegods and for all His devotees. As prANa, He causes the movements.SrI v.v.rAmAnujan gives additional references - en Aviyai, naDuvE vanduuyyak-koLginRa nAthanai (tiruvAimozhi 1.7.5); naRpAl ayOddhiyil vAzhumSarASaram muRRavum naRpAlukku uittanan (tiruvAimozhi 7.5.1); ottAiep-porutkum uyirAi (tiruvAimozhi 2.3.2). SrI rAdhAkRshNa SAstri refers usto "yad-vai prANiti sa prAnah (chAndogya 1.3).409. prANa-dah - The Life-giver.om prANadAya namah.This nAma occurred earlier (66, 323), and will re-occur as nAma 956. Theinterpretations were: a) prANAn dadAti iti prAna-dah - He who gives life(SrI Sankara and SrI BhaTTar); b) prANAn dyati iti prANah - He who takesaway the vital airs at the time of death (SrI Sankara); and c) prANAndIpayati - He who purifies and brightens the vital airs (SrI Sankara).The aspect of His giving life has also been interpreted as His giving theability to the nitya-sUri-s to enjoy Him constantly, which is the sustenanceof their life.The dharma cakram writer points out that when bhagavAn gives life in theform of the sun, the beings that receive this light are more lively than thebeings that do not get exposed to the sun. Similarly, those who identifythemselves with their body are not in an awakened and energized statecompared to those who realize that they are the belongings of bhagavAn.bhagavAn in His mantra svarUpa awakens the spiritual light in those whochant the gAyatri mantra, and this in turn leads to God realization. ThusHe gives life in different ways to the beings of this world. a) He who makes others bow before Him.b) He who deserves to be worshiped.om praNamAya namah.praNAmayati iti praNamah. By His superior character, He makes others bowbefore Him. SrI v.v.rAmAnujan refers us to divya prabandham - "ilai tuNaimaRRen ne~njE! ila~nkaiyai IDazhitta kURamban allAl kuRai (nAnmugantiruvantAdi 8) - Except for Lord rAma, there is no one else fit for us toworship.An alternate version for this nAma is praNavah - He who is praisedimmensely. SrI Sankara quotes sanatkumAra - praNamantIha vai vedAs-tasmAtpraNava ucyate - He for whom prostrations are made in the veda, is praNavah.praNavah refers to the praNava mantra, and this is considered the verbalrepresentation of bhagavAn - mantra svarUpi. Well-known.om pRthave namah.The word pRthuh is derived from pratha prakhyAne - to become famous. SrIBhaTTar gives references to the following: pRthu-SrIh pArthivAtmajah (bAlakANDa - 1.8) - The son of king daSaratha is endowed with world-wide renown;teshAm atiyaSe loko rAmah - (bAla 77.28) - Amongst them rAma was the mostreputed. 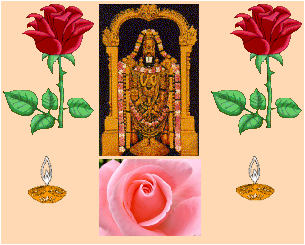 SrI v.v.rAmAnujan refers to divya prabandham - nigar il pugazhAi -(tiruvAi mozhi 6.10.10).SrI Sankara gives the meaning "He who has expanded Himself as Cosmos". SrIsatyadevo vAsishTha gives the explanation for this interpretation - prathvistAre - to spread out, to expand. The viSva rUpa of mahA vishNu is anexample of pRthuh in both senses - He who is well-known through His virAtsvarUpa or He who is spread throughout cosmos in His virAt svarUpa.SrI rAdhAkRshNa SAstri gives an additional interpretation - His ninthincarnation among His innumerable incarnations is as pRthu mahAraja who isthe father of pRthvI. This is described in SrImad bhAgavtam 1.3.14 -Rshibhir-yAcito bheje navamam pArthivam vapuh - In response to the requestfrom the Rshi-s, He appeared in the form of pRthu. He who delights everyone's heart.om hiraNya-garbhAya namah.This nAma occurred earlier as nAma 71. The interpretation given was a) Hewho is in a lovely abode viz. parama padam, or b) He who is the originatorof all that is the object of fulfillment or joy. hiraNya refers to gold.The analogy here is that just as gold is pure, very attractive, and highlycoveted, paramapadam is suddha-sattva, and hence the reference to hiraNya.One who generates all that is great is hinraNya garbhah. SrI v.v.rAmAnujangives reference to tiruvAimozhi 10.9.11 - toNDar ALvadu SUzh-pon-viSumbe -SUzh-pon-viSumbu here referring to "niratiSaya tEjOrUpamAna paramapadam".hiraNya also refers to the vIrya that He had in Him and that resulted in thecreation. This is another explanation for the nAma that is given by SrIrAdhAkRshNa SAstri.Just as gold is hidden in the heart of the earth, He is hidden in the heartsof His devotees. He is hiraNyagarbha in this sense as well (SrIrAdhAkRshNa SAstri).SrI radhAkRshNa SAstri gives a connected account of the nAma-s startingwith viakunThah and ending with this nAma in terms of creation. BhagavAnvaikunTha who has unobstructed and enormous energy, descended from His stateof parama purusha and decided to reside in the beings in this Universe inthe form of purusha in this body as if it is vaikunTha. Then He convertedthe prAna Sakti which operates the prakRti into a form which supported thebeings, and thus becme prANa-dah. Thus resulted this Universe, the AkASabeing the first of the bhUta-s (tasmAd-vA etasmAdAtmana AkASas-sambhUtah).First there resulted the great sound of praNava (pEroli). From this AkASa,there resulted the other bhUta-s (AkASAd-vAyuh, vAyoragnih, agnerApah,adbhyah pRthivI), and thus He expanded into the cosmos (pRthuh). ThispRthu is the Father of this Universe. pRthvI is the daughter of thispRthuh. Starting from the sthUla form, and following through with thebestowing of the SUkshma form, He then gave the prANamaya, manomaya, andvi~jnAna maya koSa-s to His creations as the hiraNyagarbhah. Thus,starting from the nAma viakunThah, and up to the nAma hiraNya garbhah, thesecret of creation is nicely revealed. The Slayer of the enemies.om Satru-ghnAya namah.Satrum hanti iti Satru-ghnah. SrI BhaTTar points out that He subdues byHis arrows of wisdom the senses which lead away the people to the enjoymentof earthly pleasures. That is, when one mediates on Him, this is how Heslays the enemies to the devotee's realization of Him. The mind is comparedto rAvaNa and his ten heads to the ten sense-organs.SrI Sankara gives the interpretation that He is the destroyer of the enemiesof the gods. SrI satyadevo vAsishTha interprets the nAma as referring toHis act of punishing those who violate His dictum. He who is full (of love and affection)om vyApatAya namah.From nirukti we have - nIca pUjya avisesheNa vyApanAt vyApta ucyate -Because He does not distinguish between young and old, master and servant,friends and foes, when it comes to showering His affection. SrI BhaTTarrefers us to SrImad rAmAyaNa -paurAn svajanavat nityam kuSalam paripRcchati | puteshvagnishu dAreshu preshya-Sishya gaNeshu ca || nikhilena AnupUrvyAcca pitA putrAniva aurasAn || ((AraNya2.37,38)Also, "ripUNAmapi vatsalah" - Even towards His enemies rAma is kind" -yuddha 50.56.Another interpretation given is that He pervades everything (SrI Sankara,SrI cinmayAnanda, SrI rAdhAkRshNa SAstri). He who moves (towards His devotees).om vAyave namah.SrI BhaTTar: He is called vAyu because He Himself goes seeking His devoteeswherever they may be. Examples are His going to Sabari seeking her withrespect, His visit to bharadvAja in his ASrama, His friendship with guha,etc.SrI satyadevo vAsishTha gives the derivation - vAti sarvatra gato bhavatiiti vAyuh - vishNuh. He who is spread out everywhere in this Universe.There is not a single place in this Universe where air has not entered ordoes not exist. This is the guNa of bhagavAn.The dharma cakram writer reminds us that this is a nAma that emphasizesbhgavAn's guNa of being all-pervasive. He gives reference to gItA - "puNyogandhah pRthivyAm - I am the principle of sweet fragrance in the earth(7.9). We can survive without food or water for a few days, but withoutvAyu we can't survive even for a few minutes. Without bhagavAn we can'tsurvive, period. This is the concept this nAma should remind us. vAyucomes to us without our seeking; so does bhagavAn - He seeks His devoteesand goes after them (see SrI BhaTTar's vyAkhyAnam in the beginning). vAyudoes not distinguish between people in any way; so does bhagavAn mingle witheveryone with equality of disposition.SrI cinmayAnanda points out that He is not just the air but the life-givingforce behind the air.SrI Sankara derives the meaning from vAti - gandham karoti iti vAyuh - Hewho is the cause of smell. SrI rAdhAkRshNa SAstri refers us to theupanishad - vAyurasmai puNyam gandham Avahati - aitareya 1.7. bhagavAn isthe antaryAmi for vAyu, and makes vAyu perform its functions -"yo vAyau tishThan-vAyorantaro yam vAyur-na veda yasya vAyuh SarIram yovAyumantaro yamayati, esha te AtmAntaryAmyamRtah" - bRhadA 3.7.7.SrI rAdhAkRshNa SAstri gives several passages from the Sruti to bring outthe uniqueness and importance of vAyu among the devatAs. The Sun, moon,fire and water all merge into vAyu when they disappear - vAyurvAva samvargoyadA vA agnirudvAyati, vAyumevApyeti, yadA sUryo'stameti vAyumevApyeti, yadAcandro'stameti vAyumevApyeti,yadApa ucchushyantivAyumevApiyantivAyuhyavaitAn-sarvAn-samvRkye (chAndogya 4.3). When theindriya-devatA-s such as the sun and the moon enter the sushupti state, vAyucontinues to be active as the prANa vAyu - mlocanti hyanyA devatAh, navAyuh, saishA'nastamitA devatA vAyuh - bRhadA 1.5.22. bhgavAn vishNu bearsthe earth through His vibhUti as vAyu - kim tad-vishNor-balamAhuh |vAtAt-vishNor-balamAhuh | (taittirIya 1.8.3). vAyu is the thread thatkeeps this world together like a string holding the beads of a chain;without this the world will break apart like a chain with a broken string;bhagavAn is this force - vAyurvai gautama tat-sUtram, vAyunA vai gautamasUtreNAyam ca lokah paraSca lokah sarvANi ca bhutAni sandRbdhAni bhavanti(bRhadA 3.5.2). Thus vAyuh and its vital role in the existence andsurvival of this Universe is the reason for bhagavAn's nAma as vAyuh. He who does not get diminished.om adhokshajAya namah.He is adokshajah because He never gets diminished even though He is enjoyedby His devotees. SrI v.v.rAmAnujan gives the most appropriate support forthis from nammAzhvAr - "yAnum Etti mUvulagum muRRum Etti pinnaiyum tAnumEttilum tannai Etta Etta engu eidum? tEnum pAlum kannalum amudamumAgit-tittippa" - tiruvAimozhi 4.3.10.He is adhokshajah also because His vitality never diminishes, and He is notdiminished by repeated births and deaths - adho na kshIyate jAtu yasmAttasmAt adhokshajah (mahAbhArata udyoga 4.69.10). adhah means down or below,and kshIyate refers to getting diminished.SrI Sankara gives an alternate interpretation - He who is perceived when thesense organs (aksha gaNa-s) are made inward-looking. He gives reference tothe following verse, whose author or source are not known. adho bhUte hyakshagaNe pratyag-rUpa-pravAhite | jAyate tasya vai j~nAnam tena adhokshaja ucyate ||Yet another interpretation given by SrI Sankara is "He who manifests Himselfas the virAt between the sky (aksha) and the region below (adhah) i.e., theEarth" - aksham adhah tayor-madhye vairAja rUpeNa ajAyata iti adhkshajah.SrI rAdhAkRshNa SAstri adds yet another dimension: adhah - j~nAtRtvabhAvAthInam, akshajam j~nAnam yasya sa adhokshajah - He who is not recognized byindriya-s such as the eyes etc., even though He is everywhere, ineverything.